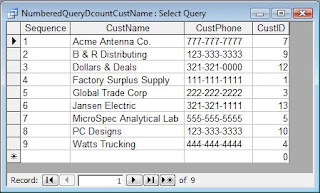 This sample db demonstrates use of check box array for populating a junction table serving many to many relationship between clients and training courses. Data is stored in normalized manner in tables T_Clients, T_Courses and T_ClientCourses. No temporary table is needed. 1.1 - Client particulars are displayed in the parent form while all available course options are displayed in a subform, as a matrix of virtual new records. 1.2 - As and when the user clicks a check box into selected state against desired course in the subform, the row in question gets converted into a freshly entered actual record in the junction table. 1.3 - Similarly, if a check box is clicked into a de-selected state, corresponding record in junction table gets deleted. This is accompanied by a virtual new record getting displayed in lieu of the recently deleted actual record (At all times, the subform matrix continues to display all available course options). 2.1 - Adequate number of check boxes along with child labels are inserted in the form at design stage. This is a one time exercise, using the subroutine P_AddControls(). 2.2 - Each check box column of this datasheet form (used as a subform) represents an individual course. A crosstab query, based upon Cartesian join between tables T_Clients and T_Courses, serves as the record source. 2.3 - As and when the user clicks a check box into selected state in desired course column, a record with appropriate values for ClientID and CourseID gets added to the junction table. 2.4 - Similarly, if a check box is clicked into a de-selected state, corresponding record in junction table gets deleted. 2.5 - First three columns display client name, list of courses opted and total number of courses opted respectively. These three columns are frozen so as to always remain in view while the user moves across check box columns representing individual courses. 2.6 - Third column depicts total number of courses opted for each client. Bottom cell of this column shows the overall total courses opted for all clients. Overall total is also depicted within parenthesis in header caption for this column, so as to always remain in view despite vertical scrolling. 2.7 - For each course, total number of clients who have opted for it, is depicted within parenthesis in the caption for respective column header, so as to always remain in view despite vertical scrolling. So far in this series on Domain Functions, I've discussed the general syntax (Domain Functions Demystified) and problems involved in building criteria expressions (Domain Functions Demystified: Criteria Expressions). Unfortunately, many of the examples I've given are relatively trivial. So for my next few blog posts, I thought I'd give what I consider truly useful applications of domain functions. One interesting problem is how to create a numbered sequence in a query, that is, have each record numbered sequentially. This is fairly easy to accomplish in an Access report. All you need to do in a report is add an unbound text box. In the control source, put =1 and set the Running Sum property to Over All. But suppose you don't want to do it in a report. Suppose you want to do it directly in a query. There are two different ways to accomplish this. The first uses the Domain Aggregated function DCount and the second uses a Correlated Subquery. Since this series is devoted to domain functions, I'm going to concentrate on that. Both of these methods require a unique column in the table to create the sequence on. This could be the Primary Key field or any field that has a Unique Index. In the Customers table, there are two such columns, CustID (Customer ID), which is the primary key, and CustName (Customer Name), which has a unique index. Domain Aggregate functions are an Access-only method to return statistical information about a specific set of records, whether from a table or query. DCount in particular will return the number of records in a given recordset. It has three arguments: 1) an expression that identifies a field, 2) a string expression that identifies a domain (that is, the table or query), and 3) a Criteria, which is essentially an SQL Where clause without the word WHERE. In the query, it will look like the following. The Order By clause in the query is important. This will sort the query on the CustID field. We'll need to have that order to use the criteria argument in the DCount. 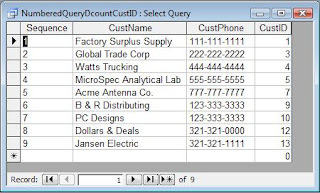 For each record in the query, Access runs the DCount function. The DCount returns the number of records in the domain where the CustID in the function is less than or equal to the CustID in that record of the query. So in the first record, the CustID is 1. So the DCount opens the domain (essentially opens the Customers table again) and it sees that there is only 1 record whose CustID is less than or equal to 1. So it returns 1. Then it processes the second record. The CustID of that record is 3, and the DCount function sees that there are only 2 records which have an CustID whose value is less than or equal to 3. So it returns 2. It is not necessary that the Order By field is an unbroken sequence. As long as that field has unique values and is sorted, it will work. The output of this query looks like Figure 1. Strictly speaking, you wouldn't need to show the CustID number in the query at all. However, I included it to show that while the order is the same as CustID, the sequence number does not have gaps in the numbering sequence. You don't need to use a number field as your Order By field. You can sort on text fields and number the query as well. As I said, this can also be done with a correlated subquery, which I may discuss at a later date. 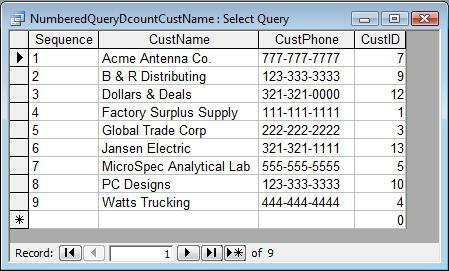 However, you can find both methods on my website in this sample: NumberedQuery.mdb. One of the classic uses of a domain function is using the DMax() to generate your own "autonumber" field. The reason you would want to do this is if you want an unbroken sequential number field. The Autonumber data type cannot guarantee an unbroken sequence, so if you want one, you have to develop it yourself. 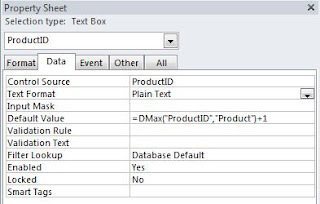 While there are several ways to do this, one of the simplest is to use a DMax function in as the Default Value of a control on a form. So let's say I want to generate my own sequential Product Number for a product table. I can create a form based on the Product table, and create a textbox bound to the ProductNum field. In the DefaultValue property, I would put the following domain function. This opens the Product table, find the largest ProductNum and add 1 to it. That's it. It becomes a little more complex in a multi-user environment, since two or more people may try to select the same number at the same time. There's a fairly simple solution for multi-user collisions, but it requires a tiny bit of VBA code. So, if you have a collision, the IncrementField function will go out and grab another. You can find a working example of both the single-user method and the multi-user method on my website here: AutonumberProblem.mdb. Fieldname refers to the field against which the function will be applied. RecordSource refers to a table or query from which the records will be pulled. The third argument, the Criteria expression, is the most confusing, so it might be useful to take a closer look at them. A Criteria Expression is an SQL Where clause without the "WHERE" keyword. Just as in a Where clause, sometimes the value of the expression needs to be delimited, sometimes it doesn't. What determines the delimiter (or lack of one) is the data type of the field. "[OrderDate] = #" & Me.txtOrderDate) & "#"
String or text values are the trickiest type and cause the most confusion. String values must have string delimiters: either quote marks (") or apostrophe ('), but since the entire argument must also be encased in string delimiters you have to somehow tell the expression evaluator which string is which. So suppose I want to use CustName in my domain function. "[CustName] = "" & Me.txtCustNum & """
"[CustName] = """ & Me.txtCustNum & """"
can be fixed surrounded with quotes this way and it will not error. "[CustName] = ' & Me.txtCustNum & '"
"[CustName] = '" & Me.txtCustNum & "'"
Now, you might ask, why would you ever use the double quote if the apostrophe will work? Well, if your data can have an apostrophe in it, (like O'Brian) you have to use the double quotes. 'Add the appropriate delimiters, depending on the data type. FixUp = "#" & varValue & "#"
Using this method, it doesn't matter what data type or delimiter, the function fixes it automatically. One last problem. What if you have both embedded apostrophes and quote marks in your string value? For instance, you have a height value which is a string with feet and inches like this: 6' 3". This will cause a problem regardless of which delimiter you use. In my next post, I'll look at some in-depth examples of how Domain Functions are used. In Microsoft Access, domain functions work like mini-SQL statements that can be used in queries, forms, reports, or code. Domain functions can also be used in places where SQL statements cannot, like the control source of a textbox. Like an aggregate (or totals) query, the domain functions build a resultset (that is, a set of records) and then apply a function to it. Unlike a query, however, a domain function can return ONLY one value. Access has several built-in domain functions, the most common of which are: DCount(), DLookup(), DSum(), DAvg(), DMax(), DMin(), DFirst(), and DLast(). DCount() returns the number of records of the resultset. DLookup() returns the value of a field in the resultset. If the resultset has multiple values, it returns the first one. DAvg() averages the values of the indicated field of the resultset. DMax() and DMin() find the highest and lowest values (respectively) of the resultset. DFirst() and DLast() finds the first and last values (respectively) of the resultset. Note: At first glance, DFirst and DLast appear to be same as the DMax and DMin, but it they're really very different. DFirst returns the very first record in the recordset, which may not be the minimum value. Likewise, the last record in the recordset may not be the maximum. In general, I avoid DFirst and DLast as being less than useful. One popular myth is that domain functions are slower than other methods. This is not true. In some cases, the domain functions can be as fast or faster than other methods. If performance is an issue, you should test both methods to and see which performs better. Each argument must be a string expression and must, therefore, be surrounded with quotes. This can be a problem when the Criteria Expression must also have quotes in it. I'll get to that a bit later. Numeric values do not need delimiters (DLookup example below). 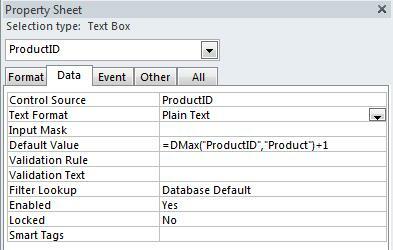 Date values need the # delimiter around them (DMax example below). Strings need either the apostrophe (') or quote (") delimiters (DSum example below). DLookup("SSN", "tblEmployee", "[EmpID] = 16")Returns the social security number of employee number 16. Returns the average cost of all printers from the Products table. DSum("Cost", tblProduct", "[Category] = ""printer"" AND [Manufacturer] = ""Epson"""
Returns the total cost of Epson printers from the Products table. Because the entire Criteria Expression must be string delimited, the expression evaluator will get confused when using the quote to delimit a sting value, so you have to use two quote marks ("") in place of one ("). I'll discuss this in a later post. So far, I've just used hard-coded values in the Criteria Expression. That's not the most useful application of domain functions. Domain functions become most useful when you use a variable for the value in the Criteria Expression. will return the total price for a particular order (1). (The value is not delimited with quotes in this case because order number is a numeric field.) But if I put this expression in the control source of a textbox on a continuous form, it would always show the same value, regardless of the other values on the screen. In the first example, it is calculating the total for order 1 regardless of the other values in the row. In the second, it calculates the total based on the order number of that row. Criteria expressions in domain functions are confusing, so it might be useful to take a closer look at them, which I will do in my next post: Domain Functions Demystified: Criteria Expressions. Should I use the Compact On Close feature of Access? I generally try to dissuade people from using the Compacting on Close feature of Microsoft Access, especially in a multi-user environment. Why? Well, there are a variety of problems. First of all, if your database bloats so quickly that it needs to be compacted every time it closes, then you have a design issue that should be addressed. See my blog post: How can I How Can I Compact my Access Database Less Often? The two major causes of bloat are 1) importing data to a temporary table for processing and 2) creating temporary, intermediary tables with Make-table queries or other methods. The data import problem can be addressed by linking a table or file for processing rather than importing it. If it can't be linked, it can be imported into a second, temporary database and then linked. This temporary database can be deleted later. 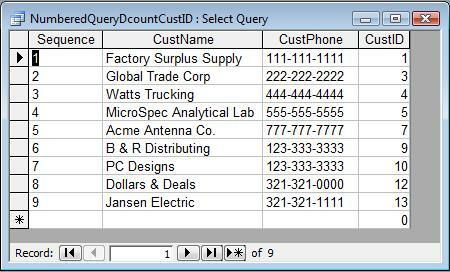 I have a sample on my website called ImportToTempDatabase.mdb, which illustrates how to do this. The problem of intermediate tables can also be solved by use of a temporary, local database which you create at startup and delete on database close. The solution is similar to the data import solution. Secondly, compacting a database that doesn't need it will actually slow down the database some. Not a lot, perhaps, but some. Every database needs working space that Access has to create. If your database grows a lot on first opening. but then very little on subsequent uses, this isn't bloat. It's the normal working space that your database needs. Removing that working space every time you close the database requires Access to create it again the next time you use it. Thirdly, it may be useless. A majority of Access databases are (or should be) in a Front-End/Back-End (FE/BE) configuration. This is often called a "split" database, where the tables reside in a separate database from the one which holds the queries, forms, reports, and code. Compacting on Close will only effect the database actually being used, which in most cases is going to be the FE. Unfortunately, it is the BE where the bloat actually occurs, so at best, compacting on close is useless, at worst, it's actively dangerous. Which leads me to the next point. Fourth, and most importantly, there is a chance of database corruption any time you compact the database. Admittedly, with more reliable networking hardware and software, this chance is smaller than in years past, but it's still there. A small database on your local drive probably has little chance of corruption. However, even a single-user database if it's very large and on a network has a chance of some network glitch causing the whole compact/repair to fail. A failure during a compact means the database is toast. There is no recovery. A large, multi-user database on a network has a much greater chance of failure. So, I prefer to do a compact as a deliberate action rather than a hidden default. Often, when compacting a large database on the network, I will copy it to my local drive, compact it locally, then upload it back to the network. This gives me a backup in case anything goes wrong. Also, if you compact the database programmatically (I have samples on my website: CompactDatabase.mdb and CompactBackEndDB.mdb), you have control to make a backup if you wish. Today, I'm in Australia, speaking at the Office DEVCON 2010. I'm very excited to be asked to present here and it's a wonderful opportunity to see Australia. My topic is: Data Warehouse in Access. Ridiculous? Not so! The premise is that there is nothing inherent in the definition of a data warehouse that excludes the use of Access as an implementation platform. Certainly, Access has limitations of size and speed, and I'm not proposing its use as an Enterprise Data Warehouse. What I am proposing, however, is you can use the principles of data warehousing (dimensional model, calculated columns, etc) to make a super fast reporting database for your transactional system, especially with respect to aggregate data reporting. There are two sessions. Part 1 discusses the structure of an Access data warehouse (or data mart if it makes you more comfortable). Part 2 discusses various methods of reporting from your warehouse/mart. This sample db demonstrates three tier cascaded treeview control for student tests and grades, with two way synchronization visa-vis associated subforms. Treeview at left displays classes and students while the second treeview shows different levels of tests for various subjects - for the class in question. Third treeview displays test results for current student, showing date of current test and marks obtained. Grades can be entered / edited conveniently just by clicking the pertinent check boxes. For convenient viewing, as soon as a given class node caption is clicked or navigated to (say by Up / Down arrow keys), it expands, displaying all student nodes belonging to that class. Simultaneously, all other class nodes get collapsed. For navigation as well as editing, the treeview and subform are mutually synchronized. Any action on treeview is reflected on corresponding record in the subform and vice versa. This sample db demonstrates positioning of selected block of rows in desired manner in the display window. Datasheet as well as continuous forms are covered, with the option to set start position of first row of selected block at top, middle or bottom of display screen. Recently, I ran into a question on the internet about normalization that I thought would be good to repeat. I'm toying with the idea of starting a new project, so I'm in brainstorming mode for table design. I'll be recording customer information in this application. Typical stuff: First and Last Names, Company, Street, Apt, City State and Zip, Phone numbers(s) and extensions, E-mail. My customer information then would record only the zip code (PKZipID). And I could then use queries for the state, city, and zip information for forms, reports, etc. Or is this beyond overkill? By strict normalization theory, having City, State, and Zip in the same table violates the 3rd Normal Form because there are functional dependencies between those fields. However, functional dependencies are not all the same. There are strong dependencies and weak dependencies. A strong dependency is one in which the value of a dependent field MUST be changed if another field is changed. For instance, suppose I have Quantity, Price, and ExtendedPrice, where ExtendedPrice is a calculation of the other two. If I change either Quantity or Price, the ExtendedPrice MUST be changed. A weak dependency is one in which the value of a dependent field MAY be changed if another field is changed. City, State, and Zip are examples of weak dependencies. If I change a person's city, I may not have to change their state. They may have moved within the same state. Likewise, if I change the state, I may not have to change the city. There is, after all, a Grand Rapids, Michigan and Grand Rapids, Minnesota. The relationship between city and zip is even more complicated. Now, it is possible to represent these fields in a fully normalized fashion, but I contend that it is more trouble for very little gain. There are two main reasons for normalizing data: minimize redundant data and maximize data integrity. Both of these can be achieved by using lookup tables for City and State without trying to represent the relationship between the two. A zip code could be mis-typed, of course, but it could also be mis-selected from a list, so to my mind there's no real reason to have a lookup table. If you did normalize these fields, you could have a selection process that would present all possible combinations of values if you selected the City. For instance, if you had a combo box for City, you could have cascading combo boxes to select only the appropriate States and Zip codes. But it would be just as easy to mis-select the right value from this list as it would be to mis-select from independent lookup tables. And, of course, you'd have to create and maintain these relationships. Therefore, normalizing City, State, and Zip adds a complication to your data model for very little gain, and in my opinion, is a good example of when to denormalize. Help! My Database is Corrupted, and I Can't Repair! As a follow up to my recent series on compacting databases, I thought I should say a word about the repairing part of Compact and Repair. As a file-based database system, Access is more susceptible to corruption than a server-based database like SQL Server. However, Access databases are not quite as fragile as many believe. 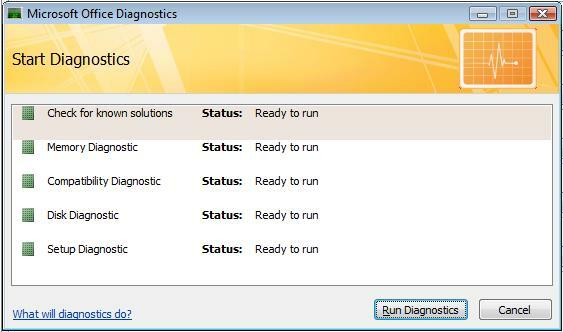 The most common causes are external to Access: PC hardware problems, network problems, users shutting down Access, or killing the Access process when it is accessing the disk. A few are internal: use of the Name Autocorrect feature, multiple users using the same file, or memo fields. These last do not cause corruption, but corruption is more likely when used. In my experience, most of the time a corrupt database can be fixed by Compact and Repair. I personally have had only one database that was not. That one happened when I lost network connection while I was compacting the database. But although it doesn't happen often, Access databases can be corrupted beyond repair, or at least beyond the ability of Compact and Repair to fix. In some cases, you've no alternative but to resort to your backup. (You DO back up your database regularly, don't you?) But there are things you can try before you have to resort to that. The following links are some of the standard references for recovering a corrupt database. This sample db demonstrates resizing of access forms so as to suit current screen resolution. In addition, user has the option to carry out custom resizing - if desired. (a) Simple controls - all free to float and resize. (b) Simple controls - with certain controls having tag property settings for locking their position and / or size. (c) Combo box and list box. (d) Nested subforms - Continuous. 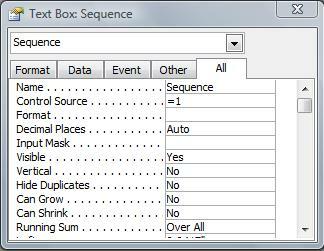 (e) Nested subforms - Datasheet. (f) Tab control having (i) Nested subforms and (ii) Option group. (a) LockLeft: The control retains a fixed distance from left edge of the form. (b) LockRight: The control retains a fixed distance from right edge of the form. (c) LockTop: The control retains a fixed distance from top edge of the form. (d) LockBottom: The control retains a fixed distance from bottom edge of the form. (e) LockLeftRight: The control expands in such a manner that its left edge retains the original distance from left edge of the form, while its right edge retains the original distance from right edge of the form. (f) LockTopBottom: The control expands in such a manner that its top edge retains the original distance from top edge of the form, while its bottom edge retains the original distance from bottom edge of the form. (g) LockSize: The control retains its original size. (h) LockWidth: The control retains its original width. (i) LockHeight: The control retains its original height. Demo forms have all been designed for a screen resolution of 800 x 600. On opening any of these forms, it resizes automatically to suit the screen resolution currently in force (if it happens to be different from the designed one). So far in this series, I have talked about what compacting is, how it works, and several ways to compact, both through the Access Interface and in VBA code. However, one subject that's rarely discussed is how to reduce the need to compact the database in the first place. The number one reason for compacting is due to "database bloat", where records are added, deleted, and the space is not recovered until compacted. Reducing bloat will reduce the frequency of having to compact your database. A split database is one in which the application (queries, forms, reports, macros, and code) are in a separate physical database file (known as the Front-End or FE) from the tables (which file is known as the Back-End or BE). Since bloating affects the tables most, having them in their own file means that only the BE needs to be compacted. As I showed last time, this can be initiated from the FE fairly easily. There are other good reasons besides this to split your database, including improved multi-user access and less corruption. Splitting the database is such a good idea, in fact, that I recommend it for almost every application. Instead of importing files to a temporary table, consider linking them. You can link many kinds of files including external Access tables, Excel files, text files, or other external sources. These linked tables do not contribute to bloat nearly as much as importing them, although as we'll see later, processing them may cause some database growth. Of course any time you add records to your database, the file size will grow. Nothing can be done about that. But minimizing the amount of temporary data you import to your database will keep growth within normal bounds. If you must import data to a table for some reason, consider creating a temporary database to store the data and link those tables into your database. After you're done with the import process, the temporary database can be deleted. You an even create, populate, link, process, and delete temporary databases programmatically from your FE application. On my website is a small sample database called ImportToTempDatabase.mdb which illustrates how. Not all bloat is bad. Some of it is necessary. Aside from inserting and deleting records, databases can grow due to internal processing. When the database engine runs a query or a recordset based on a query, it has to process and store it somewhere, and that "somewhere" can cause your database to grow. This growth is not a cause for concern. If you find that immediately after compacting your database grows dynamically at first, but then slows to minimal growth, that first, dramatic growth is just Access creating the working space it needs. How Can I Compact the Current Access Database in Code? In my previous two posts: (What Does It Mean to Compact My Access Database? and How Do I Compact an Access Database? ), I discussed what compacting a database does and how to do it through the Access User Interface. But it is also possible to use VBA code to do it as well. Why would you want to use code? Well, if you're making an application for others to use, you might want to give them a button to compact the database so they don't have to know the menu/ribbon selections. You may also want to control when or how the compacting is done. You cannot compact the open database by running a macro or Visual Basic code. The Send Keys method is a way of sending keystrokes in code to the Access Interface. Since the menu/ribbon is different depending on your context (and which version of Access you're using) the send keys argument can vary quite a bit. First of all, you need to put the code in an Event Procedure behind a button on a form. This will give us the form menu/ribbon context. I'm not really partial to that solution, though, because, as I said, I don't like to rely on a specific key sequence that can vary from context to context and version to version. Close the main database and launch temporary database with the /x switch which initiates the compact process. On my website is a small sample database called "CompactDatabase.mdb" which illustrates this process. The CompactDatabase method can also be used on an external database (in fact, it's easier to do so.) This is useful if you have split your database into a Front-End and a Back-End. You can use the CompactDatabase method directly from the Front-End against the Back-End. The BE, which stores the tables, is generally the one that needs compacting most. I've also got a sample called CompactBackEndDB.mdb which illustrates this. The real usefulness of the DAO method is the safety and flexibility you have. Instead of deleting the old database, you can rename it (say, by adding a date to the file name) so that you keep a backup. In fact, the CompactDatabase method can also be used simply to create a backup of the database. For completeness, I should mention it's also possible to compact a database with ADO. However, since I have no direct experience with it (I prefer DAO), I'll just give a Microsoft knowledge base article on the subject: http://support.microsoft.com/kb/230501/en-us. No discussion of compacting would be complete without addressing methods to reduce the need to compact in the first place. I'll conclude this series next time with that. Access databases are designed to grow dynamically as data is added. Access will also create working space to manipulate data. However, while it will grow dynamically, it does not shrink automatically when records are deleted or when it's data maniulation is done. What's more, as data is added and deleted, the database can become fragmented (much like a hard disk is fragmented), and records can be stored out of primary key order. All of this can degrade the performance of your database, especially as it gets larger. Compacting the database corrects these problems. Access creates a new, blank database called db1.mdb (Access 2003-) or database1.accdb (Access 2007+). When the process completes successfully, it deletes the original database. Lastly, it renames the new database to the original database name. This process does a number of things that improves the performance of your database. First of all, the database is "defragmented", that is, it rearranges how the file is stored on the disk. This is different than a disk defrag, but the effect is much the same: putting data into contiguous blocks. In this process, empty space is reclaimed, usually leaving the database file size smaller. This is the most common reason given for compacting, but perhaps not the most important. Secondly, it rearranges the order of the records by writing them in primary key order. This is the equivalent of a Clustered Index in other database implementation and makes the read-ahead capabilities of the database engine more efficient. Thirdly, it rebuilds the table statistics which are used by the query optimizer to optimize queries. It also forces a re-compile of your saved and embedded queries based on these new stastics. Lastly, since technically it's called Compact and Repair, it will fix any page corruptions caused by hardware or network problems. So, how exactly do you compact a database? There are several ways, both manual and programmatic, and I'll discuss that in my next post: How Do I Compact an Access Database?. Starting with Office XP, Microsoft introduced the Detect and Repair feature for all Office applications. This is different than the Access Compact and Repair in that it detected and repaired problems with the Office application itself (Word, Excel, Access, etc.) rather than a particular file. In a way, it was like launching the Office Repair from Control Panel > Add/Remove Programs, except it targeted just the application you launched it from. If launched from Word, it would repair only Word. If launched from Excel, it would detect and repair problems in Excel only. If...well you get the idea. 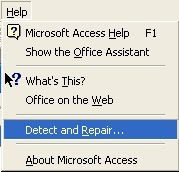 In Access XP and Access 2003, Detect and Repair was launched from the Help Menu. 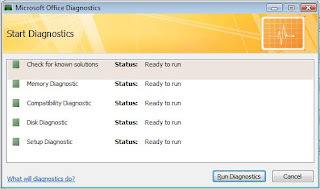 In Access 2007, they changed it to a more comprehensive utility called Microsoft Office Diagnostics, which is launched from Office Button > Access Options > Resources Tab > Diagnose. This will launch the original Detect and Repair. And lastly, add the macro to a custom group on the Ribbon. How do I add a value to a combo box with Not In List? The combo box control has a nifty event called NotInList. If the LimitToList property of my combo box is set to Yes, and I type a value that is not in the drop-down list, the NotInList event will fire. This will allow me to capture this event and add some programming to it. Before I go further, I should explain that a combo box can have its drop-down list (the RowSource property) filled by a query, a field list or a value list. The scenario I'm addressing here is a the row source filled by a query from a separate look-up table. So suppose I have a form where I want to fill in Employee information including what Training they've had. There's a combo box on the form called cboTraining that is filled from a table called tbxTraining that lists the available training opportunities (Word, Excel, etc.). Now suppose further that an employee takes a new type of training that is not already in the training table, say Access. Since I have LimitToList set to Yes, I can't just type "Access" into the training field. I have to select an item in the list. But I also don't want my data entry person to have to stop what they're doing, open the tbxTraining table, add the value, then go back to entering data. This is where the NotInList event comes in. I can programmatically add the value to my tbxTraining table, refresh the combo box, and the data entry person can just continue on. What I'm going to discuss now is the code that goes between those two lines. There are a number of different ways to implement adding a value to the drop-down list. Some are easier but dangerous. Others are harder to implement, but safer. MsgBox "Training type does not exist. Creating new Record in Training table." strsql = "Insert Into [tbxTraining] ([Training]) values ('" & NewData & "')"
You do want to be a little careful about allowing this depending on the data entry people. It's possible to get multiples of training with slight variations. For instance, a data entry person could add "Access" or "Access Database" to the training table, both of which would refer to the same type of training. I'm not saying this shouldn't be implemented, but you do need to be careful how you do it. This can still give me logical duplicates if my user isn't careful. (Sometimes they'll just say "yes" without ever thinking about it, which is just as bad as the first option). Another way that is even safer is to programmatically open the maintenance form (say, frmTraining) when the user types a value that isn't in the list, allow them to add the record manually, then save and return to the record in the transaction form. There are other variations on this theme. On my website, I have a small sample database called NotInList.mdb which illustrates these and other options. I've been seeing more and more people having problems with the Unrecognized Database Format when creating or modifying an Access 2007 (accdb) format database in Access 2010 and then trying to open it again in Access 2007. Import all the objects from the old database to the new. The file will then be readable by A2007. The following link explains it more in detail: http://msdn.microsoft.com/en-us/office/cc907897.aspx. I'm told that it is also possible to make the original file A2007 readable by removing the A2010 features and then making a minor edit to the file in a Hex editor. But I'd be wary of that approach. Importing the objects to a new database is safer, more reliable, and frankly simpler. (a) All parts (Complete hierarchical chain). (b) Assemblies only - arranged as per relevant nesting level. (c) Assemblies only - Straight. (d) Base parts only - arranged as per relevant nesting level. (e) Base parts only - Straight. Simultaneously, the hierarchical chain of sub-assemblies and components gets depicted as tree view. Total cost of base parts (i.e. items which have no child assemblies or components) also gets depicted at bottom of tree view. Contents of tree view remain in step with the latest selection (out of five listed above) in option group. Also, there is two way synchronization between tree view and the lower subform at right. If the user selects any node in tree view, corresponding record in subform becomes the current record. Conversely, if the user navigates to any record in the subform, corresponding node in tree view assumes selected state. PartID of matching record in the subform gets highlighted in a manner similar to the shade signifying selected node in treeview. As the user navigates through master subform at top left, the contents of tree view as well as the two subforms at right keep getting updated as per current selection (treating current PartID on master subform as the top item for which hierarchical chain is to be extracted). This sample illustrates two different ways to create a "Rolling Average" query. It averages the latest 13 months in the sequence. The first two use DCount and the second two use a Sub Query. You must identify a unique column in the query to create the sequence on. I used an autonumber ID field, which while in order, has gaps in it. The DCount method creates an updateable recordset. The SubQuery method produced non-updateable recordsets. You can find the sample here: RollingAverages.mdb.